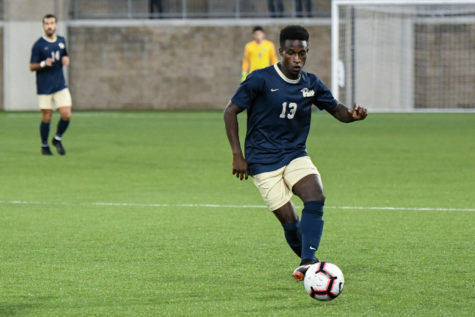 Sophomore forward Edward Kizza (9) scored both of Pitt’s goals during the Panther’s 2-0 victory over Virginia Wednesday night. 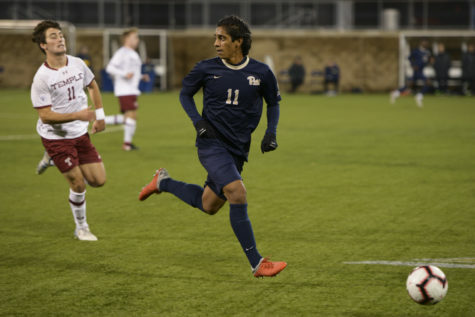 The Pitt men’s soccer team opened ACC tournament play Wednesday night by shocking No. 6 Virginia, beating the Cavaliers 2-0 in Virginia and giving the Panthers their first ever ACC tournament win since joining the conference in 2013. 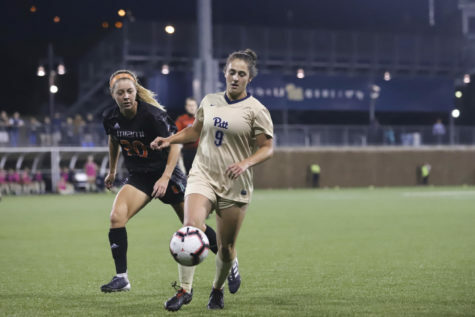 In their only two previous trips to the ACC tournament, the Panthers hadn’t so much as scored a single goal, losing 5-0 to Notre Dame in 2017 and 4-0 to Syracuse in 2016. 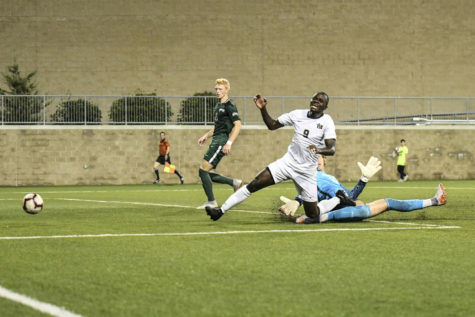 This time, as he was all season long, sophomore forward Edward Kizza was the difference-maker, scoring both the go-ahead goal in the 62nd minute and the nail-in-the-coffin goal 17 minutes later. The clutch performance gave Kizza his 14th and 15th goals on the season — 11 more than any other Pitt player — while moving the Panthers’ record to 8-10 overall and 3-6 in the ACC. 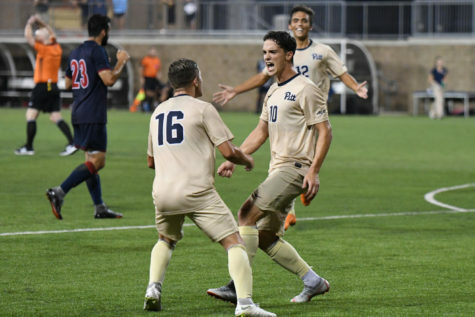 The victory also served as Pitt’s sweet revenge, since Virginia (9-3-3 overall, 3-2-2 ACC) beat them by the same score at Pitt’s home stadium earlier this season. Prior to Wednesday’s game, the Panthers were 0-7-1 against the Cavaliers and 0-5 at Virginia’s Klockner Stadium. The Panthers played a perfect first half, as they completely thwarted any attempt from the Cavaliers to dominate early while also getting a few offensive chances of their own. Virginia played with only three defenders rather than four — a testament to their offensive-minded strategy — to pressure the visiting Panthers early. The Cavaliers showed their quality throughout the first 45 minutes with strong passing and shots on goal. They primarily utilized sophomore midfielder and New Zealand-native Joe Bell on the left side of the field. But Pitt’s defense held firm, keeping Virginia from finding open spaces in front of the net. 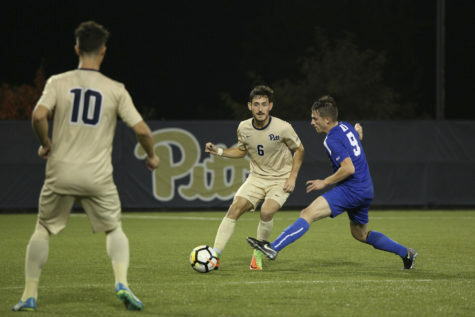 This was accomplished through gritty defensive work, which also resulted in yellow cards for Pitt redshirt senior defender Robby Dambrot and first-year midfielder Jackson Walti. On the offensive side, Pitt attacked with sophomore forward Alexander Dexter and first-year defender Nyk Sessock on the perimeter of the Virginia defense. Despite a strong shot on goal from Dexter 17 minutes in, the Panthers could not break down the Virginia defenders, who had the speed and strength to keep pace with the Panther players. The Cavaliers completely shut down Kizza early on, with sophomore defender Henry Kessler shadowing him and preventing him from keeping possession or garnering a shot on goal in the middle of the field. 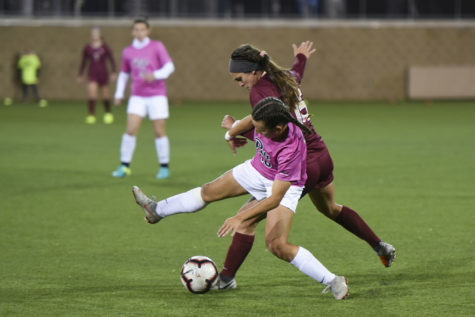 Overall, the first half was dominated by midfield play and hard-fought possession from the Panthers to keep the ball away from Virginia’s playmakers. In the second half, Virginia continued its attacking push, attempting to bury the Panthers with goals before they could get one first. This tactic almost worked, with a chip shot from sophomore forward Irakoze Donasiyano soaring just over the Pitt goalposts after he broke behind the Panther defense seven minutes into the half. As the Cavaliers ventured forward, Pitt was waiting to counter. 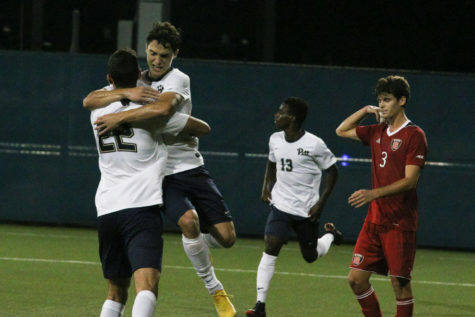 Kizza found more and more freedom to create chances in the open field, and the first goal of the match came in the 61st minute when Kizza shed his defender to find a wide patch of space to send the ball into the Virginia net. 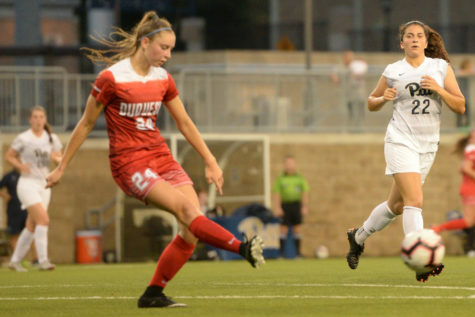 Virginia increased its aggression after the goal, which Pitt attempted to counter by keeping long spells of possession and forcing the Cavalier players to go through the middle of the field rather than around the perimeter. These attacks again provided opportunities for a counter-strike, with Kizza taking advantage. 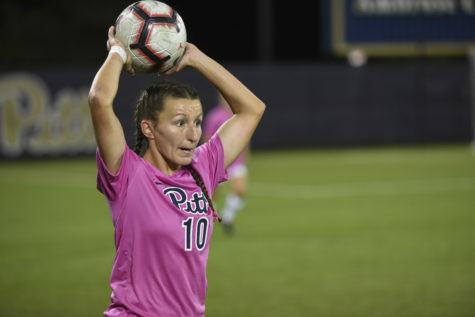 In the 79th minute, Kizza charged towards goal and delivered a right cross to first-year defender Chandler Vaughn, who won the Panthers a corner. 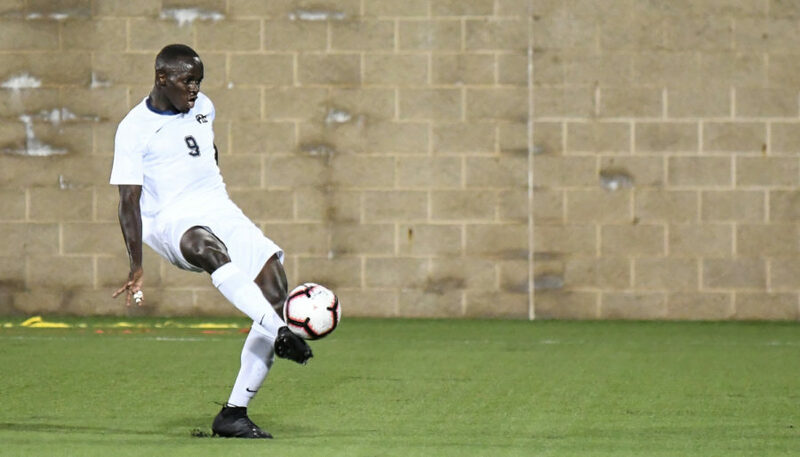 Pitt used the corner opportunity to deliver a decisive goal, as Alexander Dexter poked the ball past Bell, where it fell for Kizza to earn his second goal of the night and the major upset for the Panthers. With this win, Pitt advances to its first ACC quarterfinals in program history. The Panthers will face the No. 3 seed Duke in Durham, N.C. on Sunday. Virginia still has a guaranteed place in the NCAA tournament, but their dream for an ACC championship this year is over. Pitt must win the ACC championship to enter the NCAA tournament, meaning they’ll have to pull off a second straight upset over the Blue Devils.